The Dr. Bradford’s Glisten Skin and Coat for Dogs Support was formulated to give your dog a naturally beautiful coat and problem-free, healthy skin. 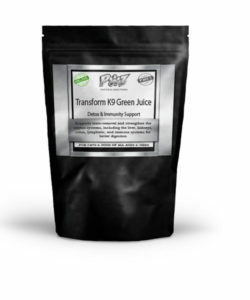 It works to boost the immune system, cleanse the blood, and supply nutrients to the inner and outer parts of the body. Category: Supplements Tags: dog itching dry skin, dog itchy skin, dog skin care, dog skin products, dog with dry skin, dogs dry skin, dogs dry skin remedies, dogs skin, dogs skin allergies home remedies, dry dog skin, dry skin for dogs, dry skin in dogs, dry skin on dog, dry skin on dogs, dry skin on puppies, Skin and Coat for Dogs, supplement for dogs dry skin, supplements for dogs with dry skin	SKU: skin-and-coat-for-dogs. Skin and Coat for Dogs: This supplement, formulated by Dr. Bradford, is an excellent Skin and Coat for Dogs Support for recovering from Hotspots, Ringworm, Hives, Warts, Dandruff, Mange, or simply dry, scaly skin and a dull, poor pigmented coat. This supplement detoxifies and nourishes to provide the body with nutrients that are not normally found in their daily diet. It’s perfect for dogs young and old and gives a competitive edge to show dogs that will be judged on coat quality. It’s highly palatable and easy to feed. Glisten Skin and Coat for Dogs is a must have. Your pet’s coat will look and feel great with this supplement for dogs. 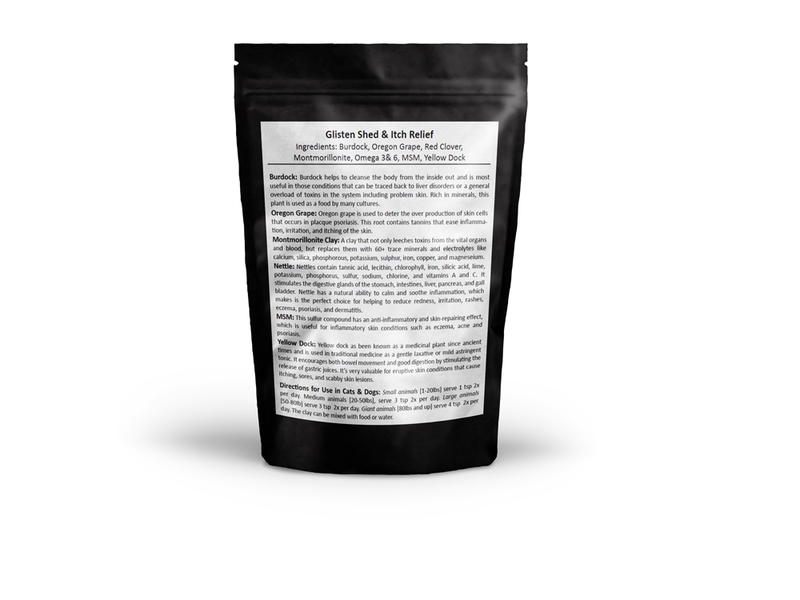 This Skin and Coat for Dogs supplement is the second phase in our Shed & Itch Protocol and features a blend of natural herbs that contain vital vitamins and essential fatty acids. This unique formula works internally to improve skin health, reduce shedding & itching, and restore your dog’s coat to a lustrous shine. Shedding is normally caused by a lack of nutrients in the blood stream to nourish the skin and coat; restoring the health of your dog’s Skin and Coat for Dogs will help to reduce non-seasonal allergies and excessive shedding. Benefits: Helps Maintain Skin and Coat for Dogs Health. A strong tool in skin and coat repair, fighting signs of aging, and bringing back the luster and beauty of the skin and hair in animals! Burdock: Burdock helps to cleanse the body from the inside out and is most useful in those conditions that can be traced back to liver disorders or a general overload of toxins in the system including problem skin. Rich in minerals, this plant is used as a food by many cultures. Oregon Grape: Oregon grape is used to deter the over production of skin cells that occurs in placque psoriasis. This root contains tannins that ease inflammation, irritation, and itching of the skin. Montmorillonite Clay: A clay that not only leeches toxins from the vital organs and blood, but replaces them with 60+ trace minerals and electrolytes like calcium, silica, phosphorous, potassium, sulphur, iron, copper, and magneseium. Nettle: Nettles contain tannic acid, lecithin, chlorophyll, iron, silicic acid, lime, potassium, phosphorus, sulfur, sodium, chlorine, and vitamins A and C. It stimulates the digestive glands of the stomach, intestines, liver, pancreas, and gall bladder. Nettle has a natural ability to calm and soothe inflammation, which makes is the perfect choice for helping to reduce redness, irritation, rashes, eczema, psoriasis, and dermatitis. MSM: This sulfur compound has an anti-inflammatory and skin-repairing effect, which is useful for inflammatory skin conditions such as eczema, acne and psoriasis. Yellow Dock: Yellow dock as been known as a medicinal plant since ancient times and is used in traditional medicine as a gentle laxative or mild astringent tonic. It encourages both bowel movement and good digestion by stimulating the release of gastric juices. It’s very valuable for eruptive skin conditions that cause itching, sores, and scabby skin lesions. Burdock: Burdock helps to cleanse the body from the inside out and is most useful in those conditions that can be traced back to liver disorders or a general overload of toxins in the system including problem skin. Rich in minerals, this plant is used as a food by many cultures. Oregon Grape: Oregon grape is used to deter the over production of skin cells that occurs in placque psoriasis. This root contains tannins that ease inflammation, irritation, and itching of the skin. stimulates the digestive glands of the stomach, intestines, liver, pancreas, and gall bladder. Nettle has a natural ability to calm and soothe inflammation, which makes is the perfect choice for helping to reduce redness, irritation, rashes, eczema, psoriasis, and dermatitis.